The Pacific Crest Trail (PCT) meanders 2,650 miles from the barren desert near Mexico to the lush forests of Washington at the Canadian border. While over 40 million people live within a short drive of this mountainous trail, those who take on the challenge of hiking the entire PCT will pass through 50 wilderness areas and experience the joy and challenge of true solitude. 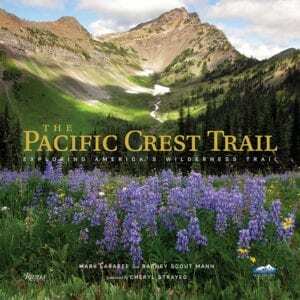 Released last fall, The Pacific Crest Trail: Exploring America’s Wilderness Trail, by Mark Larabee and Barney Scout Mann, is a 330-page coffee table book that takes readers on a visually stunning ride along this famous alpine route. The book is a true work of art, with more than 250 scenic images contributed by dozens of photographers. It’s also a rarity in the world of coffee table books: Readers will not only marvel at the pictures, but will enjoy reading it from cover to cover. Larabee and Mann’s volume is not a guidebook to the PCT, but rather a love note to those who built and promoted the trail against long odds. It’s a deep analysis of the history of the PCT, and an inspiring depiction of the eclectic group of folks who made the trail what it is today. Every year, hundreds of hikers spend three to six months making the demanding journey from Mexico to Canada on the PCT. 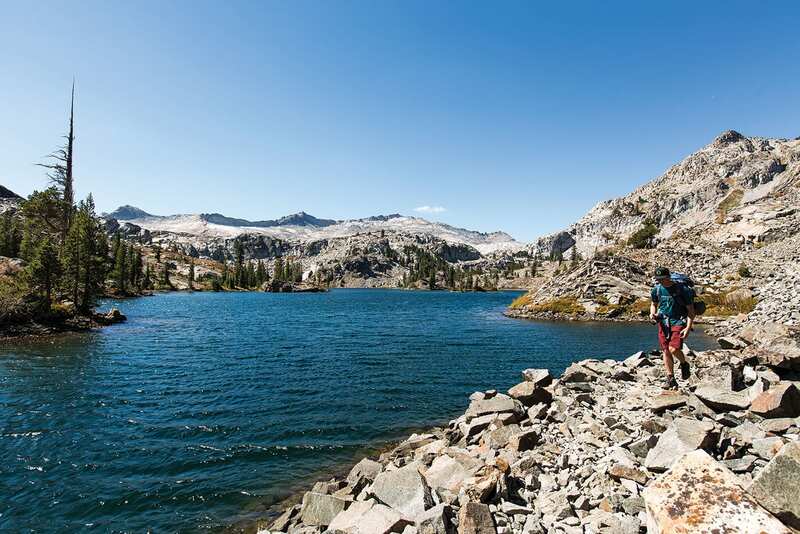 About 1,000 miles into their trek—nearly finished with the long push through the gruelingly spectacular, and most likely snow-covered, Sierra Nevada—hikers reach the granite wonderland of Tahoe’s Desolation Wilderness. From there, they follow the Pacific Crest, skirting Granite Chief Wilderness, to find views of Lake Tahoe from the top of Blackwood and Ward canyons. Even people who day-hike a section of the trail—a common endeavor in the easily accessible Tahoe stretch—have been known to fall in love with it. But those who thru-hike the PCT often find it to be a life-changing experience. One of them is The Pacific Crest Trail co-author Mann, who completed the trail with his wife in 2007. Now 65, he credits “this five-month time of absolute wonder and indescribable pain with your partner,” as the reason he dedicated his life to the trail. Although the hundreds of miles of the High Sierra between Mt. Whitney and Yosemite are perhaps the most dramatic part of the trail, Mann says he also has fond memories of the Tahoe region, where the PCT shares over 50 miles with the Tahoe Rim Trail (TRT). In what will not surprise Tahoe residents, Mann says they saw the largest black bear on their entire thru-hike—which appeared to be “the size of a small car”—near Alpine Meadows. After his thru-hike, Mann retired from his legal career and served on the Pacific Crest Trail Association (PCTA) board for nine years. He also served a term as the PCTA Board Chair. Along the way he became the PCTA’s resident expert on the long and fascinating history of the PCT. In January 2015, the PCTA began working with Rizzoli Publications to create a book. Rizzoli had recently produced the acclaimed The Appalachian Trail, a similar tome on the roughly 2,200-mile hiking trail from Georgia to Maine. The PCTA proposed using Mark Larabee, Pulitzer Prize–winning journalist and managing editor of the PCTA. Mann primarily focused on the history portion, while Larabee used his journalistic chops to conduct the contemporary interviews used in the publication. The book also includes a forward by Cheryl Strayed, author of Wild. The Pacific Crest Trail has been well received. In 2016, it was awarded “Best Travel Book” by Smithsonian Magazine and “Best Coffee Table Book” by Backpacker Magazine. Last year was a busy one for Mann: In addition to co-authoring The Pacific Crest Trail, he also hiked the 3,100-mile Continental Divide Trail and carried on his duties as one of the PCT’s most important trail angels. Mann lives in San Diego, close to the Mexican border and the PCT’s Mile Zero. “In 2004, after hiking the John Muir Trail, we realized there was a wave of people going through San Diego each spring for the PCT. Day Zero for many is the worst day on the trail. We wanted to reach out to help them,“ says Mann. He began picking up hikers and letting them stay at his house for a night or two before they embarked on their adventure. “We feed them, let them catch their breath, and then early in the morning drive them to the start of the trail,” he says. By 2007, Mann had 35 people stay with him and his wife before setting out on their own thru-hike of the trail. It increased every year, “until now we have 650 people over nine weeks,” Mann says. This year, Mann is doing his trail angel work again, although he cut it off in mid May to thru-hike the Appalachian Trail (AT). Completing the AT will give Mann a rare membership in the Triple Crown of Hiking club, which is reserved for those who thru-hike America’s three major long-distance trails. Mann’s next goal is to publish his narrative nonfiction book on the PCT, which focuses on his thru-hike with his wife and four others who hiked the trail together. The Pacific Crest Trail: Exploring America’s Wilderness Trail can be purchased at Word After Word Books in Truckee and Sundance Books in Reno, as well as online.